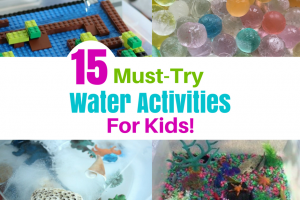 Are you looking for great summer activities for kids? Are you looking for something to keep them active and to encourage outdoor play? Then you have got to make your own kids obstacle course! This obstacle course for kids is so much fun! They made this obstacle course with my mom at her house, and then ran the course over and over again. They timed each other to see who could run it the fastest. Then they did it again trying to beat their own times! 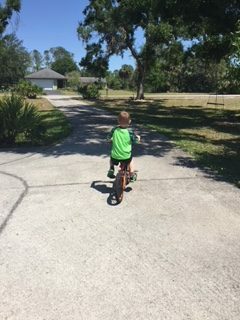 This is definitely a great way for your kids to get outside and burn off some energy! Kids have so much energy. They actually ran the course four or five times, while I barely made it once! This kids obstacle course is also a great way to work on gross motor skills! It helps improve coordination, endurance, etc. Riding a bike, walking the plank, and jumping rope are just a few of the activities in this obstacle course that will help to strengthen gross motor skills. This obstacle course is also great for kids of all ages! 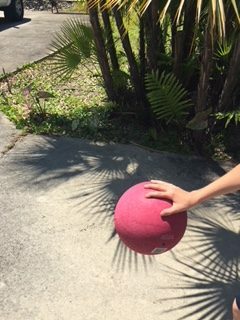 All four of my kids had a blast with this activity. Obstacle Course Kids Will Love! This kids obstacle course was made using things that were lying around the house. So be creative! If you don’t have some of the items that we used, improvise! 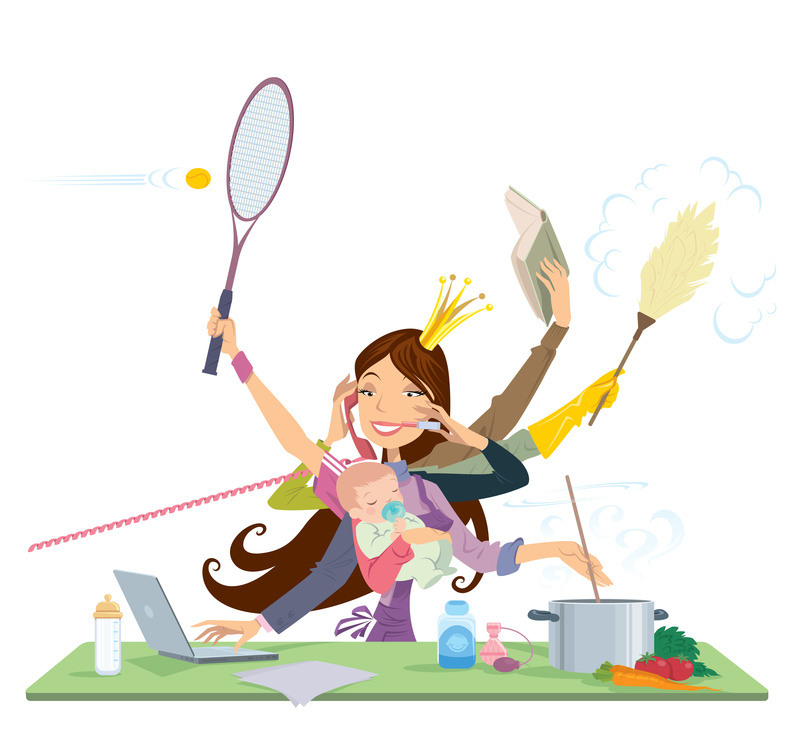 Your kids will have a blast no matter what items you use! First the kids had to ride their bikes down the driveway and around to the first obstacle. The timer started at the count of three as they took off down the driveway. And I also just want to note that they didn’t all go at the same time. They ran the obstacle course one at a time and we compared times. And it prevented everyone from falling all over each other as would have happened if they had fought to go through the course at the same time! Then they had to quickly get off their bikes and jump over all of the hurdles! 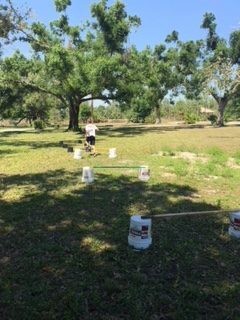 Our hurdles were made using upside down buckets and poles and branches. We used different size buckets to make hurdles at different heights. And you can use whatever you have for poles. It could be a broom, branches, whatever you have on hand. We made a total of six hurdles. After vaulting the swing;) the kids had to pause at the concrete driveway to write the first letter of their name using chalk. Next they had to run across the driveway and go over the stump! After the stump, They had to go over and through the regular swing. Sounds easy enough right? But just remember you’ve already vaulted a stump, jumped over hurdles and ridden a bike! Not to mention you’re running as fast as you can go! Is this not great exercise?! Ah to have the energy of a child:) The kids climbed them quick as a flash! 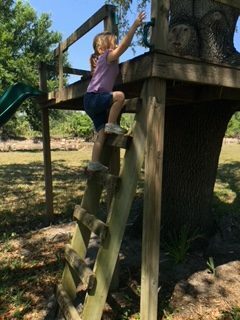 After they were up in the tree house they had to quickly come back down by way of the slide. 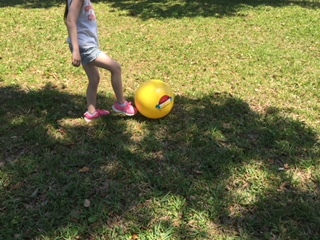 Then they ran back to the driveway, picked up the playground ball and dribbled it five times. 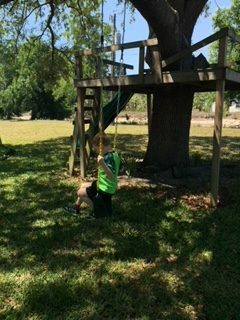 This is another great way to strengthen gross motor skills! After dribbling five times they went straight into jumping rope! My mom tied one end of the rope to the hitch on her truck and she swung the other end. 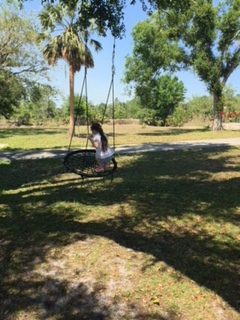 For the older kids she started swinging the rope before they got there, which is another great way to strengthen gross motor skills because they have to jump in while the rope is already swinging. 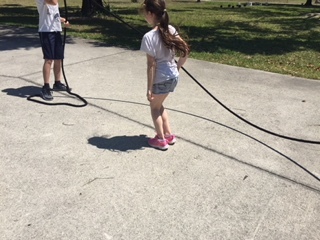 For little ones that are not able to jump rope, just swing the rope back and forth instead of over their heads, allowing them to jump over as the rope goes from side to side. They had to jump the rope two times. After jumping rope, they had to do an egg race to the next obstacle! This is great for fine and gross motor skills! We used a large spoon with a plastic egg. My mom put a rock inside the plastic egg to keep it from blowing off the spoon. Plastic eggs are a lot lighter than real eggs, so the rock is important! 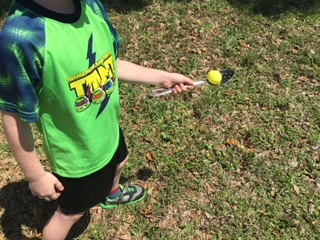 They had to pick up the spoon and egg in the grass near the jump rope and run to the next obstacle without touching or holding the egg with their other hand. When they reached the next obstacle they dropped the egg and spoon in the grass. 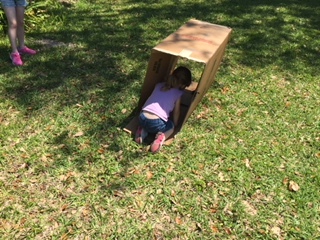 The next obstacle in our kids obstacle course was a really big cardboard box! For this obstacle they had to crawl through the box as quickly as possible. 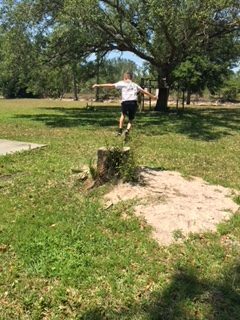 Once through the box they quickly ran to the next obstacle which was the balance beam! 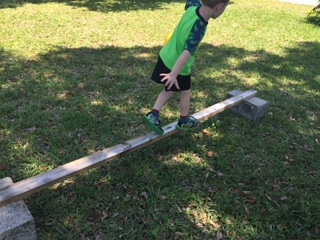 Our balance beam was made using a board and two concrete blocks. This is another great gross motor skills obstacle! After they made it across the balance beam they had one more obstacle! They had to run and kick the large bouncy ball as hard as they could so that it landed against the fence. And that was the end of the obstacle course! After one person finished the next would start. 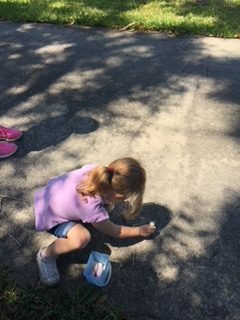 We wrote how long everyone took to complete the obstacle course on the driveway with the sidewalk chalk. Do your kids like to run obstacle courses? 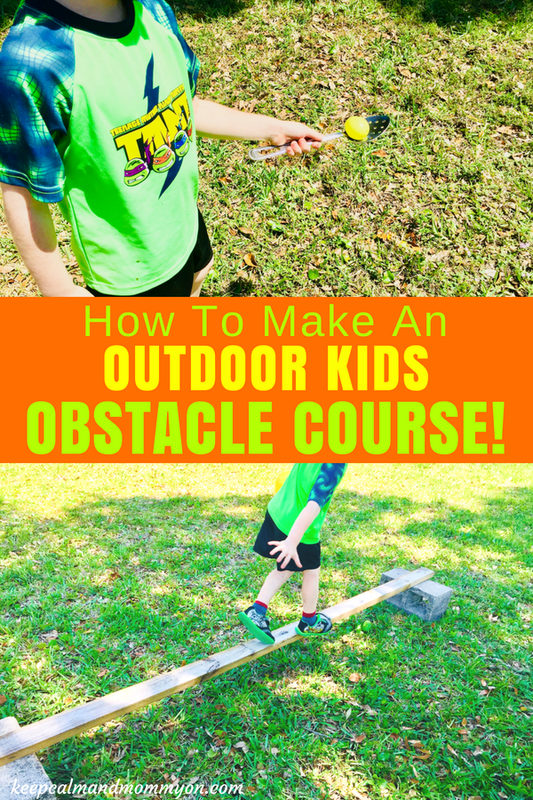 Be sure to leave me a comment and let me know what you use for your obstacle course! 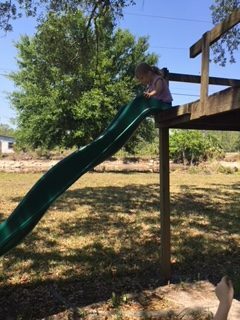 I hope you and your family have a great time outside this summer and are able to enjoy this kids obstacle course together as a family! « DIY Pencil Holder Craft For Kids!